Of all the silly garden stakes we've ever sold, none have brought more laughter to customers and friends than these ridiculous dodo bird stakes! Keep a handful, and spread the rest to friends for a good time! Looking to add some personality and humor to your garden? These silly birds have been making people smile for decades. 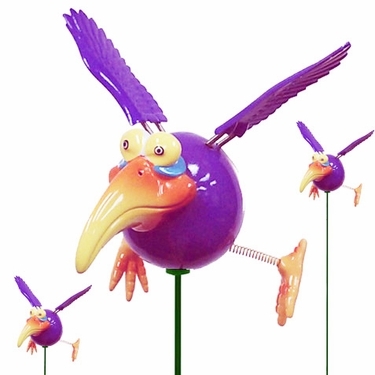 We've just found a few more sets of our discontinued Dark Purple Dodo Birds and we're blowing them out on sale! Bright colors, and wacky expression, these artistic garden stakes leave your guests in a great mood. Patented "springed" wings design moves in the wind. Special lacquer coating protects the colors. Dodo Birds Holiday Stakes - 2 Dozen!